There's nothing like a good gank to break the ice. Agent Minx Mattel received an invitation from Teo Wessette to join a private conversation. Teo was eager to discuss the recent destruction of his Covetor. Minx, in turn, was equally enthusiastic about selling Teo a mining permit. Within the first 60 seconds, Minx realized that Teo would be a difficult customer. Our Agents have good instincts about these things. Protip for all you miners out there: This isn't a good way to make a reimbursement request. When it became clear that reimbursement wasn't forthcoming, Teo terminated the convo. That might have been the end of it, but two days later, Teo lost another Covetor in the same system. Once again, Minx received a convo request from Teo. Maybe the miner would be more apologetic this time. Agent Minx was concerned for the miner. At this rate, Teo would be losing Covetors forever. Teo attempted to make small talk and asked about Minx's family. Our Agent saw right through him. Taking pity on the miner, Minx offered him a great deal on a 365-day mining permit. But Teo's mind was elsewhere. After Teo went silent for several minutes, Minx hoped that the miner's initial "gank rage" had cooled down. No such luck. Teo was still beside himself with grief over his lost Covetor(s). Whatever Teo's native language is, he managed to translate a version of the classic "you shoot ships that can't shoot back" line. All you carebears can laugh at Teo, but the line doesn't sound any smarter coming from you. Once again, Teo abruptly terminated the convo. What a grumpy miner. We've seen carebears with ironic corp names before, but Teo's takes the cake. I wonder what a mining corp with an honest name would look like? 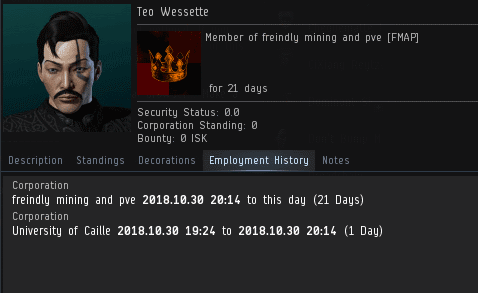 Agent Minx is probably the kindest player in all of Eve. Same goes for the rest of the Knights of the New Order. Such a stark difference between our selfless, kind, and friendly agents and the basic, selfish, and self-loathing miner. "All you carebears can laugh at Teo, but the line doesn't sound any smarter coming from you." Well said, Supreme Protector - some carebears may have a slightly better vocabulary than others - but without The Code, their thought patterns are equally as faulty. Ongoing, systematic punishment is the only way to induce correct and proper behaviour into a defiant carebear. 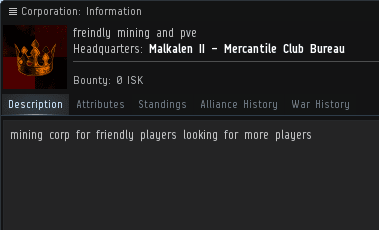 The most honest mining corp name I ever saw was 237 Mining and Production. The members were bots.